"Hot buttered English muffins, Canadian-style bacon, and poached eggs are topped with a heavenly drizzle of hollandaise sauce. Wonderful for Easter, Mother's Day, or anytime you want to treat yourself to the best brunch in the world! Serve with roasted potatoes for mopping up the extra egg yolk and hollandaise. If you prefer, you can substitute ham for the Canadian bacon in this recipe." 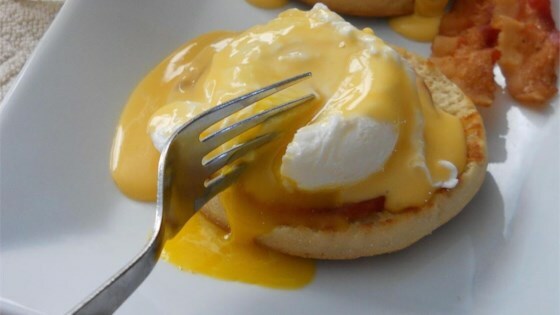 Make any brunch special with eggs Benedict--complete with homemade Hollandaise. This recipe's hollandaise sauce was just way too lemony for our tastes. My kid's couldn't even eat it!!! Cut the lemon juice down to about 2 teaspoons and it will probably be fine.